Bringing out my inner drag queen, glitter galore eye make up look! Last weekend I felt inspired to play around with make up and wanted to do a mad look with lots of glitter so what did I do? 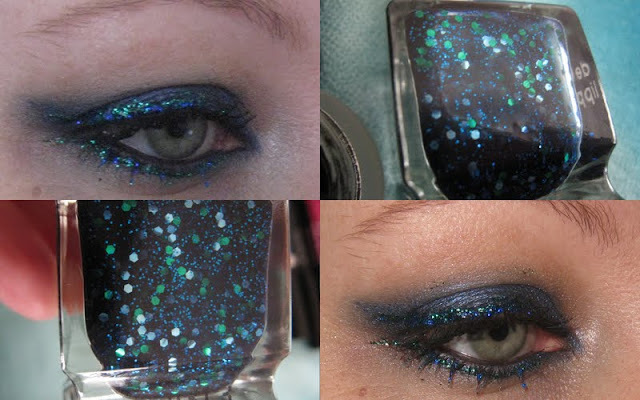 I drew inspiration from Deborah Lippmann's Across The Universe polish, so sit back and take a look at this tacktastic tutorial! Top to bottom: Bourjois Volumizer mascara, Sephora Jumbo Pencil in Midnight blue, MUA glitter liners in shade 9 and 8, Mac eye shadow in Blue Flame and Maybelline Eye Studio Lasting Drama Eyeliner. First up I used the Sephora Jumbo Pencil along the upper lid, tracing out the shape I wanted. I applied Mac's Blue Flame and patted it over the jumbo liner, softening the edges. I applied the jumbo pencil to the lower lash line, joining it to the outer edge and ever so slightly at the inner corner. Next I took the Maybelline Eye Studio Lasting Drama Eyeliner and drew a line along the upper lash line, making a wing at the outer edge. I also applied it to the upper and lower waterlines, adding some drama baby! Now it was time to go disco ball on it! I applied the MUA glitter liners on both upper and lower lash lines. The blue went on top first, going over the black line from the previous step. I applied the green glitter under my lower lashes and became mesmerized with the light reflecting off the glitter! I lashed on the Bourjois Volumizer mascara and decided I wasn't finished with the look. So I applied the blue glitter over the green glitter and vice versa, leaving me with proper drag queen eyes! I love playing around with make up like this. I'm not a professional make up artist, I'm just someone who likes to mess around with it and basically, if I can do this, so can you. There is no mad blending, mad techniques, mad products, just plopping the make up on and seeing what happens! Now, all I was missing was some fake lashes, next time! Love it & love that you were inspired by a bottle of nail polish. Such a fab similarity to the nail varnish! Is it wrong that I think I would wear this for a night out! And I thought my days of blue eyeshadow weren't to come for another 60 years! The glitter is gorgeous! :) Loving this look! Love the look..really love the shape of the eyeshadow that you applied! I wish I could get inspiration from a nail polish. But nooooo, I stick to my neutral eyeshadows, LOL. Hi Karen - that's gorgeous!